Advanced Technology Center (ATC) student Eric Lee moves swiftly through the aisles to plug in laptops to be used by tonight’s “students.” His ATC peers Emmanuel McCleod and John Houchins check login screens and enter passwords while Dakota Cecil and Frankie Larkin wheel in another laptop cart to accommodate the growing crowd. Parents, grandparents and families fiddle with computer mice at their seats, all ready to learn how to put more power in their PowerPoints. 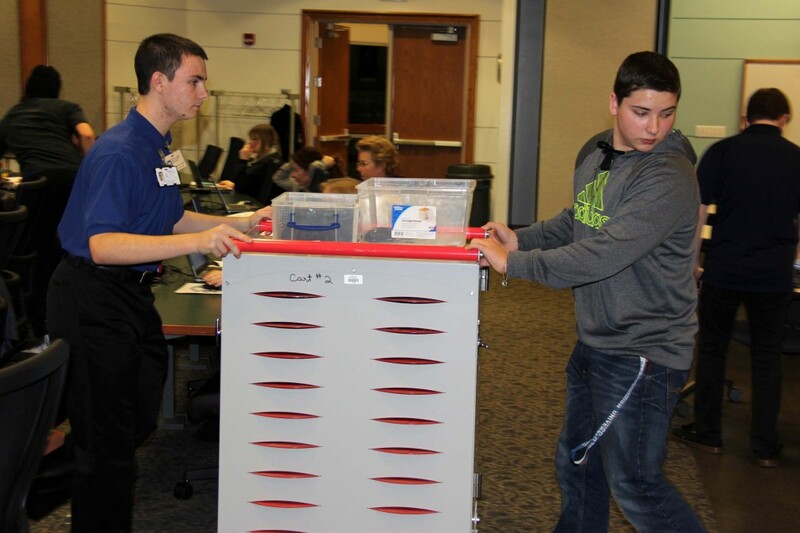 ATC students set up an extra cart to distribute laptops to the dozens of Technology Academy participants. “How many of you have seen a bad PowerPoint presentation?” asks Eileen Cox, the school division’s director of communications and community engagement. Workshop attendees nod their heads and raise their hands. More raised hands and laughter. Cox then introduces participants to their instructors, supporters, help desk and tech squad for the evening — ATC teacher Linda Lavender and five ATC students. As Lavender provides step-by-step instructions from the podium computer, students circulate the aisles to answer questions and help troubleshoot. 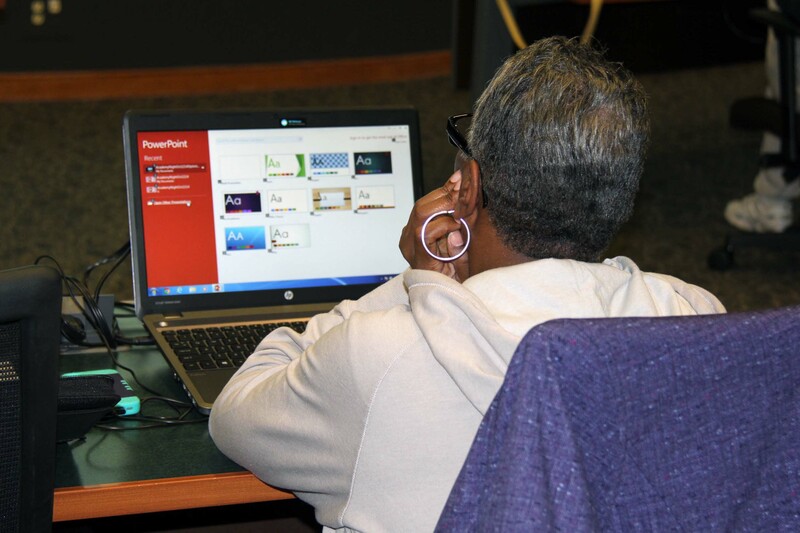 A Parent Connection Technology Academy participant reviews PowerPoint backgrounds. The class, Putting the “Power” in PowerPoint, was the third in a series of workshops offered this year through the Parent Connection Technology Academy. 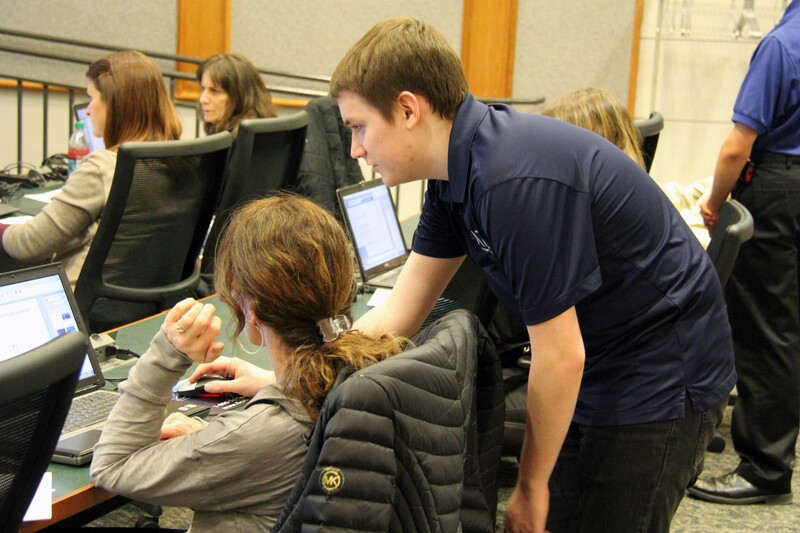 The free workshops are designed to help parents and other relatives become more familiar with computers, software and applications that students are using in class and for homework. Larkin says that his work with the Parent Connection Technology Academy combines several of his interests. Larkin will shadow current VBCPS teachers as part of his Virginia Teachers for Tomorrow experience, and he likens helping parents at the workshops to the kind of assistance he expects to provide to middle school students this spring. ATC student John Houchins helps a workshop participant with questions. Microsoft Word and social media safety were topics of previous Technology Academy sessions this school year. Future workshops in February and March will cover Windows 8 and Apple operating systems and Microsoft Excel. To register for future Parent Connection Technology Academy sessions, click here. To see additional Parent Connection events, newsletters and resources, visit vbschools.com/ParentConnection.